The Night Vale Crew are Back! Joseph Fink & Jeffrey Cranor - creators of the #1 international podcast Welcome to Night Vale - will present their latest Welcome to Night Vale novel - IT DEVOURS! Tickets Required: $24 includes 1 copy of IT DEVOURS! It all started in June 2012 as a bestselling podcast created by Joseph Fink and Jeffrey Cranor, a radio show sensation for the fictional town of Night Vale that reported on the strange events that occur within it. Narrated by Cecil Palmer, the host of the town’s radio show, Welcome to Night Vale covers news, announcements, and advertisements just like Lake Wobegon on Prairie Home Companion. . . Except it’s a lot weirder. A lot. Welcome to Night Vale: A Novel hit the New York Times bestseller list at #4. The authors appeared live on The Late Show with Stephen Colbert , were featured in a prominent New York Times profile, and the book received and continues to receive major media attention and praise. Since then, the Welcome to Night Vale podcast has been downloaded more than 150 million times worldwide. Night Vale has also become a successful touring live show, performing to sellout 1000 + seat venues in front of audiences at over 200 live shows in 16 countries and 35 US states. In January 2016, the authors announced their new podcast network “Night Vale Presents” which has launched the fictional podcasts “Alice Isn’t Dead” (March 2016. ), “Within the Wires” (June 2016), and “The Orbiting Human Circus of the Air” (October 2016). Shown left to right Joseph Fink & Jeffrey Cranor - image by Nina Subin. The presentation will be moderated by Welcome to Night Vale co-star Meg Bashwiner (“Deb” and “Proverb Lady”). 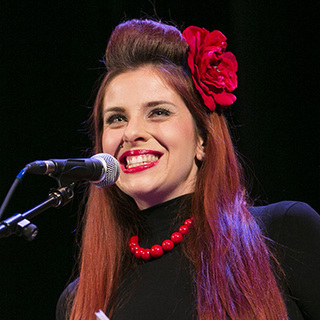 Meg Bashwiner is a writer, performer, emcee and producer. She is the Emcee of the world touring hit show Welcome to Night Vale Live. As an ensemble member of the New York Neo-Futurists she writes and performs for the popular weekly show Too Much Light Makes The Baby Go Blind which she toured to the Edinburgh Fringe Festival, The Providence Improv Festival and which headlined the Out of Bounds Comedy Festival in Austin. Her previous theatrical producing work includes the Drama Desk- Nominated The Human Symphony, Every Single Word Live and The Innovative Theater Award -Winning Locker 4173b.